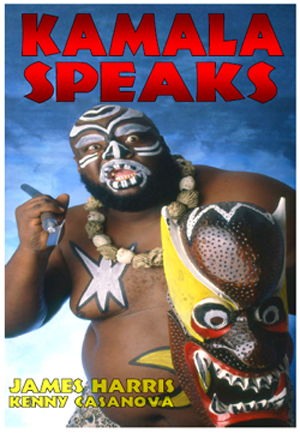 For 30 years, Kamala The Ugandan Giant gave his all. Every wrestling fan has a memory of Kamala. Maybe you hid in fear as he sauntered toward the ring with his white face paint, loincloth and spear. Or perhaps some of you cheered for him in his legendary matches with Hulk Hogan and the Ultimate Warrior. You probably even chuckled a bit when Jake “The Snake Roberts” chased him from the ring with his python. Whatever the case, the image of Kamala slapping his belly will be forever etched into the memories of anyone that watched wrestling in the 1980s and 90s. For nearly 30 years, “The Ugandan Giant” entertained us by giving everything he had in the ring. A recent article by Bleacher Report’s Jason King revealed that Kamala - once an imposing 6-foot-7 and 380 pounds - is now wheelchair-bound as a double-amputee. Diabetes forced doctors to remove both of his legs, and he’s now on dialysis. Unable to work and with medical bills continuing to mount, Kamala and his wife, Emmer Jean, are struggling financially. According to the article, the transmission on their vehicle is out, the heating and cooling system in their home is broken and money to buy groceries is scarce. After reading the Bleacher Report article - and watching the heart-wrenching video that accompanied it - I felt compelled to help. Even though it’s billed as sports “entertainment,” I’ve always appreciated physical sacrifices wrestlers make in the ring simply for the sheer enjoyment of their fans. Seizing an opportunity to repay the favor by lending a helping hand all these years later seems like the right thing to do - especially for a guy like Kamala, who wrestled during an era where performers weren’t paid nearly as handsomely as they are today. After reading the Bleacher Report story - and watching Kamala both laugh and cry during the video - I’m confident you’ll feel the same way. As as the season of giving approaches, please find it in your heart to show Kamala and his wife that you’re thinking of them by taking part in one of two fundraising projects. One way to help Kamala would be to donate here, via PayPal, on this website. Whether it’s $5, $10, $20 or even a $100 ... no gift is too small or big. Every little bit will help. Cliche as the saying may be, it’s truly the thought that counts. Heck, even if you can’t donate, feel free to leave Kamala a message in the comments section below. Apparently one of his greatest joys is hearing from his fans. Another way to support Kamala is to purchase “Kamala Speaks.” James Harris’ autobiography - ghostwritten by longtime friend/manager Kenny Casanova - will be released within the next two or three weeks. You can order the book by clicking here . Kamala will receive 100 percent of the proceeds. What a great Christmas gift! Please know this: Kamala hasn’t asked for any sort of financial support and has no idea I’ve started this page (well, at least not yet). As a diehard wrestling fan during his heyday with the WWE, this was solely my idea. A mutual friend told me that Jason King, the author of the Bleacher Report story, was working on this piece. I contacted Jason (who speaks with Kamala weekly) about doing this fundraiser. He loved the idea and said he will personally deliver the money raised on GoFundMe.com to Kamala in Mississippi once the fundraiser has ended. He also vowed to take a picture and shoot an accompanying interview with Kamala to post here as proof that your gift indeed reached The Ugandan Giant. Although the goal of this project is to raise a minimum of $20,000 by Christmas, I’m hoping the total far surpasses that. Thanks so much for reading this lengthy post and for contributing to this project. This is what the holidays are truly about. Merry Christmas and God Bless. Thank you all so much for the continued donations that have almost gotten us to our goal! This has been a whirlwind experience and I know James "Kamala" Harris has been overwhelmed by all the love and support from his fans. Hope this reaches you in good health and spirits and thank you so much again for being a part of this campaign! Just wanted to share a quick update with you all! We are going to leave the campaign open since so many of you have reached out and mentioned that you will be donating more after taxes. We hit the $33,000 mark last week which means that after GoFundMe's fees for the fundraising, Kamala has received $30,000 from all of his fans! This is absolutely outstanding and we are so happy to report that we met our goal and then some! This money has improved his day to day life as well as rejuvenated his spirit. I will be returning to Mississippi this spring and will give you all another update on where your donations went! Thank you again for your messages of positivity as well as your donations! Hi everyone! I cannot believe we are almost to $30,000!!! Thank you all for the contributions. I have a lot of people that emailed me and wanted to wait until tax return season was upon us to donate more. This is outstanding news for Kamala and his family as they are already so overwhelmed by the donations and positive messages you have all left! Thank you for the continued sharing and outpouring of messages for James "Kamala" Harris & family. Attached is the video I shot of Kamala saying thank you to his fans and supporters! I am excited to see there are still people contributing to our GoFundMe! I know that James "Kamala" Harris is in great spirits and feels the love from his fans like never before! He had the best Christmas of his life and was able to celebrate the holiday with lots of family! There are lots of international fans that have emailed me about donations and keeping this GoFundMe up and running so they can get the word out to their friends and family about donating! I am excited to hear that my story about Kamala's life after wrestling has touched so many people across the world. I hope funds continue to come in so I can make a return visit soon! I want to help Kamala as much as possible and make sure he is able to get repairs done at home as well. This is something I am definitely looking forward to in 2015! Thank you again for sharing this and spreading the word! Lots of love this holiday season! The WWF should help him out a bit don't ya think? He was a huge draw..I always watched him growing up...you guys make millions..help a classic with his medical bills...peanuts to you....come on! Believe it or not, Kamala is one of the reasons I teach Social Studies today. I really believed he was was from Uganda when I was 7. I loved his entrance music, his look, his moves. I began to get interested in learning about Uganda and Africa as a whole. Years later I teach 7th grade. I will be donating with my next paycheck. Thanks for all that you did and do man. I owe you. Much love from the Steel City! Mr. Kamala, I hope you are continuing to hang in there! I still visit this page from time to time in hopes of seeing an update. Please don't feel that we have forgotten about you out here! Kamala...hope you are still hanging tough...God bless you! Kamala, I hope you are hanging in there...just said a prayer for you. Good point Karl they could do a lot more for them and should. Stay strong Kam! As a young Airman at Tinker AFB, OK I got to see Kamala wrestle several times at the Myriad Arena in Oklahoma City along with other greats like The Junk Yard Dog (R.I.P. ), and Butch Reed but Kamala was the one that actually brought fear to the arena. He was an outstanding character and wrestler. I watched a Youtube video by James Harris telling of the injustices of Vince McMahon against him so to think that Vince would give one hoot about him now, it's not going to happen. 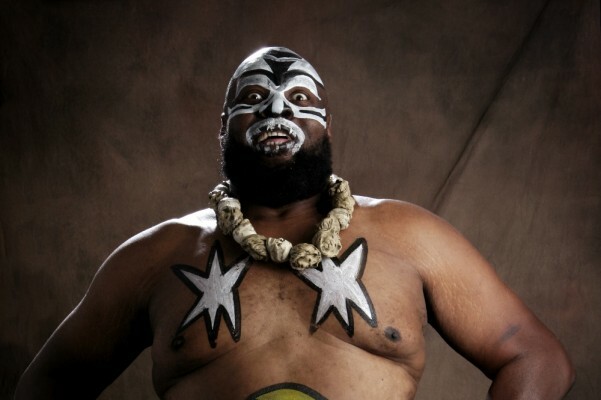 Kamala was one of his biggest draws but he was chattel of the WWF. That's all Vince McMahon thinks of any of his wrestlers. Use them for all he can get out of them and when he's done with them toss them away like used trash. I will donate to help Mr. Harris. The many years of intrigue and entertainment he gave me is well worth it. I too have been diagnosed with Diabetes and also high blood pressure so I expect to eventually go through the same things he is. Best wishes my brother. As a kid, Kamala was a one o/ those wrestlers that made me & my brother sat in front o/ the television whenever wrestling came o/. Thanks for helping to making our childhood wonderful. I loved this guy's act every time he stepped in the ring. Whether you got a kick out of it or were slightly scared, he made an impression on you. After hearing some of his back story and seeing what he faces now, he has a great spirit and outlook on life-never giving up. Mr Harris, thank you for being Kamala and for continuing to fight on past life's trials and tribulations May God bless you and be with you always!!! I am extremely happy so many of your fans and others around the world have chipped in to help in your time of need, Mr. Harris. I truly hope these small gestures help you get well, physically and spiritually. I know from personal experience what the weight of financial burden feels like. God bless you and keep you, my friend. Have always been a fan, things happen and sometimes there not good, hope you keep your head up high, and may God bless you and give you many more years of life, hope that the money raised serves you well, and please keep us posted on your well being. ..